Aachen's municipal theatre offers a broad spectrum from the spheres of opera, drama, ballet and concerts. 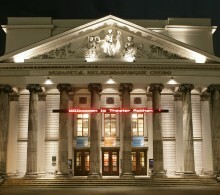 Encouraging children and young people, in accordance with their age and interests, to come to the theatre is one of Aachen theatre's particular concerns. With this in mind it has organized the project 'Theatre and School' together with the Aachen newspaper, Aachener Zeitung, which, apart from giving information about the theatre programme, also affords assistance to teachers in planning project weeks, theatre projects or series of lessons, help for groups in choosing works in accordance with their age and ability, in the ordering of tickets and organisation of visits to the performances. The varied and experience-orientated programme of the project, 'theatre and school' covers guided visits, teaching material, regular information sheets, preliminary and subsequent discussions and even attending rehearsals.